More than 6,000 recordings have already been submitted since the Australian Museum launched the app on 10 November. Scientists are excited about the sheer variety of recordings, with some endangered species in arid areas of northern Australia being captured on the app. Data from the recordings is helping scientists paint a more detailed map of frog habitats, their breeding cycle and the risks they face. Leading frog expert Dr Jodi Rowley said it was "almost impossible" for frog biologists to study the whole array of native frogs in depth, given the sheer size of the continent and limited resources. She said scientists often went out on expeditions to remote areas to track down a frog only to come back empty-handed. Thus, an app where "citizen scientists" all around the country help scientists log frog calls and identify species was of huge assistance, she said. Image caption The Roth's Tree Frog is a common species in northern Australia. "The hope is that people will record a frog we've never heard of before and we can go on an expedition and try and find it," she said. She said she had already heard some promising variations in the frog calls, which could indicate new types. She said scientists had discovered three new species in the past year alone. Many frog look species look the same, so the most accurate way to distinguish them is by their unique call. All app users need to do when they hear a frog is to hit record for 20 seconds and upload the recording to the app. The time and location of each call, caught with phone GPS technology, helps scientists map where the frogs are and identify which species are at risk. Each call is verified by a team of experts, who will chase up calls when there are promising leads. 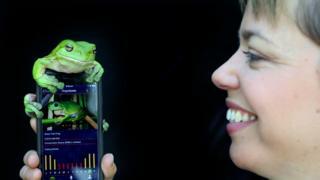 The app also contains examples of frog sounds to help with identification. Dr Rowley says the best time to record frogs is after dark and after rain. "Even if it's the frog calling in the bathroom, we want that frog every time it calls because we can get lots of information about how we can make sure they can stick around, croaking into future generations," she said.